Simply Hamper is a fast-growing online store that offers custom gourmet hampers. They faced issues with low conversion rates from their marketing campaigns, and it directly affected their customer acquisition costs. We started with a detailed ecommerce audit to find out where they are losing potential customers. We identified that product pages and the checkout page are the biggest conversion funnel bottlenecks and moved to qualitative research to find out what stops their visitors. The audit immediately revealed the issues with product customization and delivery options. Most of their products are gifts delivered directly to a recipient of a gift, not the actual customer. The visitors had a hard time adding personal messages and selecting time slots for delivery. But that was about to change. We created optimization strategy that helped them increase conversion rate by 179.1% and improve their website engagement. Here are some examples of performed A/B tests that helped us deliver great ROI, better understand their customers and keep improving their shopping experience even further. The original checkout page had a very high 83.4% exit rate due to its complexity. The personalization of their hampers required plenty of fields to fill out in the multi-step checkout form. Data showed that visitors lost their patience and simply abandoned their carts. Qualitative research revealed that customers don’t understand how to select delivery timeslot and where to add a personalized message. Furthermore, Simply Hamper used a login screen as the first step in their checkout process. Although they have a guest checkout option, the button for it was very small and was not grabbing any attention. This issue alone lost them 24.9% of potential customers. After conducting an extensive research, we created a hypothesis to fix Simply Hamper’s checkout issue. 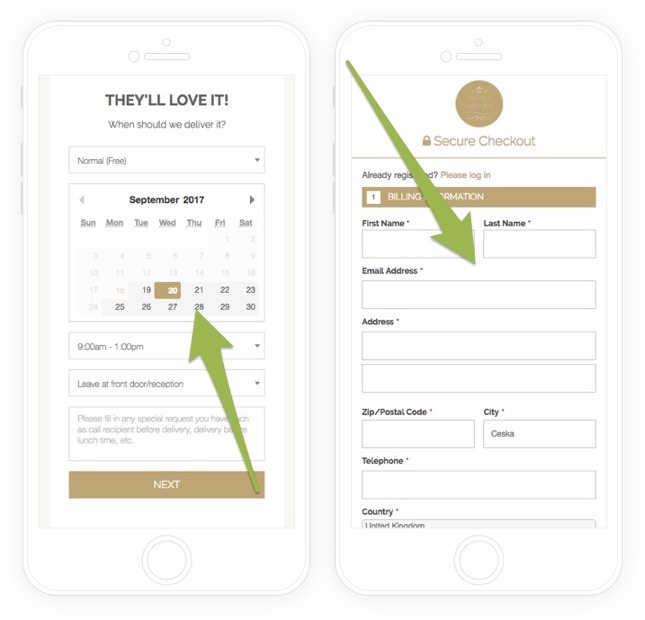 Since we can’t reduce the number of fields for personalization because all the details are needed, we separated product personalization from the checkout process. We created “Variation A” that included all product personalization fields (e.g. delivery time, personal message) directly on the product page with very clean UI. The goal was to let customers personalize their hampers before checking out and leverage the IKEA effect – people are more likely to buy products they partially created. It made the customers feel more engaged with the personalization process and closer to finishing their purchase. This allowed us to simplify the checkout page drastically and keep only simple billing details. After testing it next to the original version, we discovered that “Variation A” decreased the checkout page exit rate by 52.1% and boosted the website conversion rate by 120.4% with 98.25% chance of being the best. The new version has one additional advantage – it allows their customers to purchase multiple hampers for different recipients at the same time. The original version required them to create a separate order for each hamper. Many of their sales are from corporate clients buying products to business partners and they often buy more than one around Christmas or Chinese New Year. The option to do it in one order delivered 38.4% increase in average order values. Simply Hamper has top-notch products, but 87.3% of their visitors never added a product to a shopping cart. User research revealed that visitors wanted to see more details about their hampers including multiple photos. The original version of the product pages only had a single photo of a hamper, a short description and a list of included items. Our hypothesis focused on improving the product pages by delivering more product details. We created “Variation A” that included 5 product images with touch gestures to slide and zoom images. 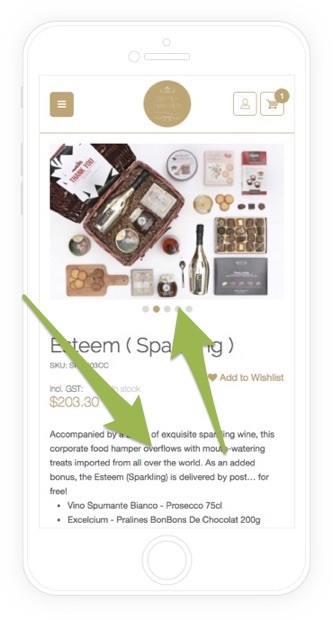 We also added a new section for long-form content explaining hamper content. The goal was to make sure visitors know everything about all the included items in the hampers and get a better feel for the quality of the final product. “Variation A” performed 62.2% better compared to the original version in add-to-cart rate and improving the overall ecommerce conversion rate by 33.1% with 96.3% chance of being the best. Our qualitative research provided a very valuable insight – many visitors are shopping for hampers only a few days before they need them delivered and their anxiety is making sure the gift arrives on time. Simply Hamper provides next-day delivery but they didn’t advertise it anywhere on their site. The original version didn’t show delivery information until the checkout page. We created a hypothesis that making the fast delivery service visible before the checkout will help convert visitors who are in a rush. We created “Variation A” that the earliest delivery date & time next to the “Add To Cart” button on product pages. The goal was to use the proximity to the main CTA and to make sure all visitors know how quickly they can deliver the products right away. 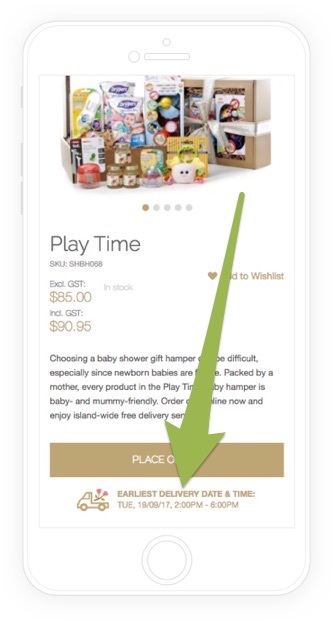 It also creates urgency for visitors who are in a rush because the feeling of missing the next available slot triggers their purchase decision. The A/B testing results show that “Variation A” increased conversion rate by an additional 14.2% with 95.9% chance of being the best. First, there is a huge benefit when the ordering and checkout processes are simplified. Customers feel more confident about their purchase and it takes away all sources of confusion and friction. Second, making a customer involved in the process of creating their product (personalized cards) makes them feel committed to their products and more likely to purchase. Third, finalizing purchase decision is significantly influenced by the amount of product information available on the page. Customers should have a clear understanding of your products, but not to the point that they are overloaded with information. Not all the hypotheses we formulated and the tests we ran were successful. In fact, our success rate was 79%, but that is the beauty of running A/B tests – insights from our failures led us to those that create the most success. Keeping a structured conversion approach helped in improving the Simply Hamper website. We took all insights from our tests and kept improving their website for many months.